15mm x 10mm End Feed Reducing Coupling EF1R. Suitable for water, gas and central heating. 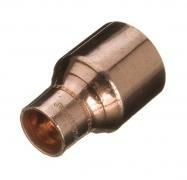 End feed fittings are suitable for water, gas and central heating applications.